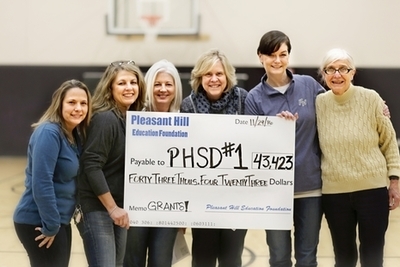 Since 1991 generous donors have made it possible for the Pleasant Hill Education Foundation to provide over $750,000 in funding to the students of Pleasant Hill. This is a profound accomplishment that would not have been possible without the support of so many. Our purpose is as important today as it was 25 years ago since Oregon ranks #39 for investment in our schools. State funding does not cover the real cost of a quality public education, so we continue to ask parents and community members to assist with funding critical to maintaining academic excellence. Your donations will continue to improve every studentï¿½s experience by directly supporting the schoolï¿½s most immediate needs. Long time Pleasant Hill High School faculty member, Timothy Meinzen, recently gave a speech about the Foundation. His words truly demonstrate the impact of your gifts. When I first came to teach here, I found a school thriving. Then the grim reaper of Measure 5 swept through and we felt like we were withering, but the Foundation has given us the tools to rebuild the school from the inside. What is important for me, for my colleagues, is that we know when we need something to help us teach, we say, ï¿½We can ask the Foundation.ï¿½ That realization is like a huge dollop of hope in our increasingly challenging vocation. We know that the Foundation has our back. What I most love about Pleasant Hill ï¿½ after the kids I have been so privileged to teach these many years ï¿½ is how deeply you all care for this pleasant school near a hill. It's never too late to make a donation! When you give to the Pleasant Hill Education Foundation, a 501(c)3 nonprofit organization, you are helping to ensure opportunities and academic excellence for every student in the Pleasant Hill School District. The Pleasant Hill Education Foundation is a 501(c)3 nonprofit organization.Tax-deductible contributions can be made via PayPal (click the donate button in the top right corner), cash or check. Cash/check donations can be mailed to Pleasant Hill Education Foundation, PO Box 636, Pleasant Hill, OR 97455. If you would like to direct your money to a certain school or program, just put that in the memo area of your check. Giving through United Way of Lane County. Just specify the Pleasant Hill Education Foundation. Give monthly through our bank account. Call us and we send you the forms. Itï¿½s an easy way to give more by spreading your support throughout the year. If you are employed by the Pleasant Hill School District, you can join your fellow employees and have your contribution taken directly out of your paycheck. Contact Shirey Bukowski at sbukowski@phillfoundation.org for more information. Thank you for your generous support of the Pleasant Hill Education Foundation!